We regret this event is occurring, and we want to assure you that we are here for you during this critical time. 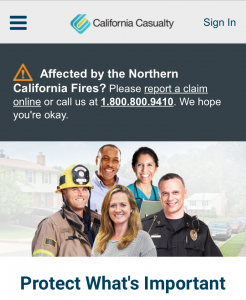 If you currently have an auto, homeowner or renter policy with our partner California Casualty and have been impacted by the devastating wildfires throughout California please Click Here to access their online claim form or call toll free 1.800.800.9410. When you call, press 4 when prompted or remain on the line for an operator and you will be transferred to a claims specialist who can assist you. The Law Enforcement Family stands proud and always stands united. Please join PORAC, along with the aid of CAHP Credit Union and Donate Today.